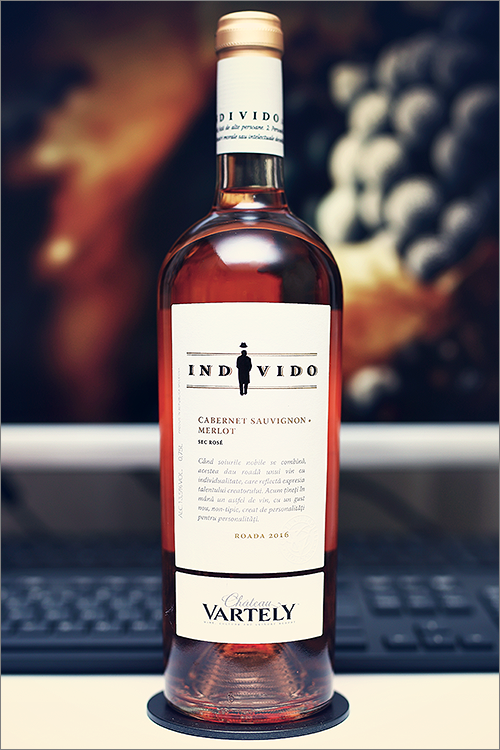 The wine we are going to review today is a well known one, as it is part of the ‘Individo‘ wine series, that is a set of 6 wines, each with its own personality and character – Individo Cabernet Sauvignon – Merlot 2016 from Château Vartely. It’s a rosé wine blend, made of 2 classic varieties: cabernet sauvignon, which adds body and structure and merlot, which is responsible for extra smoothness and balance. The biggest challenge of rosé wine is that it usually lacks acidity, which means that the wines can become flabby quite quickly. For this reason, it is better to plan in advance, aka to drink them early. That said, let’s find out just how good this wine is. Pale peach pink color with shades of pale grey towards the rim of the glass. The nose is strong, filled mostly with flavours of sweet berry fruits: strawberry, raspberry, red cherry, berberry, wolfberry, rose hips, red mirabelle, red delicious apple, red plum, strawberry jam and some subtle hints of pomegranate. The wine is extra-dry, with strong alcohol level, high acidity and smooth tannin. This is a rough, bitter and a quite sharp rosé wine, with an austere and firm profile, as it tastes seedy, fruity and aggressive towards the end. It has a fair overall balance and it feels angular and a bit too green for a rosé wine. The wine has a medium finish and a bitter-astringent aftertaste. This is definitely a fine Wine of Moldova and the overall rating says the same, with 88.7 points scored it is right there, among the best wines we’ve tasted so far. Please click on the chart icon on the left in order to get to the wine rating page, where you can find all the wines we’ve tasted to date. Conclusion: this is a wine that is definitely over its prime form – austere and rough, mainly due to high alcohol content (13.5%), which is unusual for a rosé wine. Ageing it’s not an option, as we often like to mention, it is always better to drink a wine a year too soon than a day too late, which is exactly the case with this wine, and we do take responsibility for that aspect. In order to save the day and smoothen a bit its angles, we recommend to pair this wine with some sweet-based dishes, like for example a cherry pie or some oven baked salmon. Enjoy!